Here is an article with a picture of Ben Stacy in 2012. You should read it, and get rid of that Blue Smurf fool, for none looked anything at all like him. Brenda is partially correct. That’s not Ben Stacy, it’s Paul Karason. 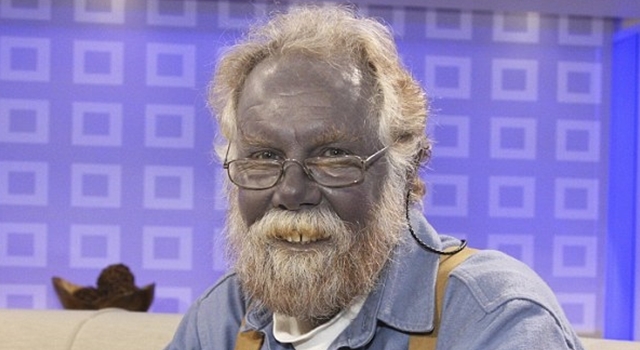 But he didn’t paint his skin, he developed the blueness unintentionally from taking huge amounts of colloidal silver. Methemoglobinemia is not a chemical, it’s the name of a disorder characterized by the presence of a much HIGHER than normal level of methemoglobin. Methemoglobin is a red blood cell protein. The predisposition toward this rare condition was simply multiplied by repeated instances of intermarriage. Thank you Buckeye Bob. It had been too long since I viewed the show with the Blue man 😀 UVA did a large study of the Fugate/Smith blue line that use to be accessible on their website. I find it interesting. There are supposedly a small group of the Inuit people that also share this condition. This is fascinating! I just found out about this doing my family history and we go back to fugates… never heard of this before… very interesting. He doesn’t paint his skin. He eats silver. He thinks it’s a health supplement.